For the last 13 years I have been training personnel in the use of breathing apparatus and wanted to take this opportunity to express some thoughts I’ve had over the years regarding breathing apparatus. As a former industrial firefighter on one of Europe’s largest chemical complexes on Teesside, in the north east of England, I have a background in BA use in firefighting, as well as that of a training officer for personnel from the chemical industry. More recently I’ve been training personnel from various off site manufacturing industries in the testing and wearing of BA. I am also a certified BA engineer, currently in Sabre/Scott apparatus, but formerly Draeger certified - although that certification has long since lapsed, and their equipment has moved on from the sets we dealt with at the time. 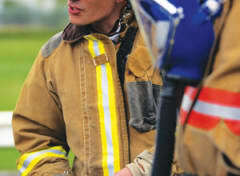 During my years as a firefighter we were regularly trained on and off site in activities involving BA wearing. We attended the local and regional fire service training facilities for both Cleveland and Tyne and Wear brigades and did the usual ‘hot’ fire, confined space and rescue scenarios. It was instilled into us that BA wearing was life dependant and that the equipment would provide us with our vital air, but that we, as firefighters, had to constantly monitor our own air and that of our colleagues to ensure that there was always sufficient to permit our return to safety. We were told that the whistle was there to tell us that we had stretched our supply of air to the max,?and that if we were still in the midst of the exercise when it sounded it meant that we had not only compromised our own safety, but that of our colleagues - and those persons we were rescuing at the time. As a general rule it was a case of if the whistle starts sounding as you cross the threshold out of the building, then you had been using or monitoring your air to near perfection. If your whistle sounded inside the building, you were not monitoring or using your air supply correctly - and as such compromised the exercise. If you returned to the entry control board area with a decent amount of air remaining and had not completed the exercise, you were not seen to have done sufficient work to complete a successful rescue and had let down those in need - not necessarily said in those words, you understand, but that was the gist of the views expressed. As a fire officer I passed on this philosophy to the crews, and since leaving the service I have always striven to instil a similar philosophy into the trainees, no matter what their role, emphasising the need for constant, regular gauge checks, not only of their own supply, but that of their partners. Indeed, getting them to understand the need for a partner while wearing BA has been difficult enough. As the years have passed, within the industry numbers of staff working on the plants have reduced to the point where automation means that in some instances there were times when the plants had only two people operating the whole plant. As you can imagine, my comments regarding multiple wearers didn’t go down too well with them at the time. I recall a conversation with a very irate plant manager who accused me of telling his teams that they had to employ more men. How this managed to be construed from me telling them about multiple wearers beggars belief, but I spent a not inconsiderable amount of time trying to explain what I actually said on the course - namely that if the need arose where a BA set was likely to be worn by a member of his two-man team, then it might be wise to call the on site emergency team first and get them to accompany his man. A simple enough solution I would’ve thought? On another occasion I was told that a plant’s procedure was that if a problem arose, one man would don a BA set, then go and investigate the problem. The remaining plant man in the control room would await a radio message to ascertain whether the BA wearer was okay. If he didn’t return or respond within 20 minutes of leaving the control room, the control man would telephone the site emergency services. Despite my protests, I was told that it was their procedure, and that ultimately it was “down to them” if this practice went wrong. Both the above plants no longer exist - unfortunately, victims of a declining market - so we never had to face the consequences of their procedures. I have no doubt, however, that there are other companies operating to similar procedures, which I find disturbing. Can we come back in three years? With recent economic events meaning that finances are restricted, many organisations are looking at training of any kind as something that can be postponed or cancelled out altogether. I have been asked on numerous occasions if the validation period for BA training can be extended, usually up to three years - although I was once asked if we could make it five years. I even went as far as to contact Scott/Sabre and asked them for a definitive answer as to their recommended re-training schedule. They kindly replied, stating that re-training schedules were pretty much down to the individual companies, but stressed that as the manufacturer they would strongly recommend 12 months between refresher training. I would assume that if the manufacturer recommended 12 months, then a representative from the Health and Safety Executive (HSE) would use that as a guideline in any sort of enquiry where the subject’s knowledge regarding the operation of the equipment was concerned, and when looking back at their last training session. As such, I always recommend that the company involved in organising the courses uses the manufacturer’s recommended timescale of no longer than 12 months between training courses for each trainee. If they ignore this advice, I emphasise that it is against manufacturer’s advice and as such it will be carried out at their own risk. So important is this that I also ask that their disregard of my advice to retrain in 12 months is given to me in writing, and that my recommendations are noted. Generally speaking, that has been sufficient to change their mind and 12 months is taken as the re-training schedule - thankfully. I used to get the same lads coming back every year, usually with the same attitude of ‘waste of time, we know it all, we use it every day’. It is these people that I worried about the most, as they were usually the people who made the most mistakes during testing and donning/doffing of the equipment. Bad practices had crept in over the 12 months since we last trained together, and serious errors were being made. Simple questions like “what is the minimum amount of air prior to donning the set?” would result in silence, or ridiculously incorrect answers. Apathy must come as part of the job description for the majority of the trainees I’ve come across. They just don’t get it. Far from being too short a timescale, maybe 12 month intervals between training courses is too long? Fire training - do I need it? I have a similar problem with fire awareness training. It is a legal requirement, but telling businesses is one thing, getting them to actually take the time to arrange the training is a completely different thing. Despite the changes that came about with the introduction of the Regulatory Reform (Fire Safety) Order 2005, whereby emphasis is placed on the business to inform all staff on the findings of their Risk Assessment, ensure that all employees receive regular training in fire safety procedures - including fire drills and actions in the event of a fire - there is still a reluctance to conform. Within the order there is also the emphasis placed on the need for businesses to have a fire warden or marshal, with extra training given to these staff members. From personal experience I find that there is a degree of apathy when it comes to fire-related training, with many organisations just not bothering, or at best, plonking people in front of a video, then asking a couple of questions - if you’re lucky - and claiming that this is sufficient. Hardly! Mind you, I once tried to emphasise a point regarding the importance of fire classification during a course by asking a passing firefighter to tell the class what a Class C fire was, to which he replied “not a clue” - and walked off. That one definitely backfired on me. By the way, I should state that I don’t have a Class C fetish - it just seems a convenient one to pick. Oh, and if you are wondering, a Class C fire for the UK is a fire involving combustible gases. And if you were wondering, I should really ask you how long it is since your last fire training session? As an aside, the growth of the internet and the seemingly limitless information available through it, does occasionally lead to some quite serious issues. I was looking for information on the web once and came across a very professional looking site belonging to a UK company. It had links to numerous organisations, including UK fire brigades and fire related businesses. Very nice, except that they had used the American fire classification system as though it was the one being used in the UK. It had obviously been copied and pasted onto their site, as it was identical to one I had seen on an American site. I took the time to send an email to inform them of the error as I worried that if someone used the information as being correct, and ultimately a problem arose, then it could possibly cause them legal problems. Their reply was that the site had been set up by a web designer and that they were unaware of the error. So much for proof reading. It amazes me that something as straightforward as fire classification and the associated icons and the colours used to denote content cannot be standardised across the globe - it would make life so much simpler if it was. Did you know that the UK, American and Australasian classification systems, icons and colour schemes are different? It is shocking that we cannot agree to standardise something that should be recognised no matter where you are located in the world, and as I’ve shown, this could cause problems to someone trying to gather the information for use with their staff. Even more reason to use a dedicated trainer in the subject rather than a mere video. The nature of my work over the years has generally meant that the BA equipment has been maintained by a third party, with recharging, servicing, cleaning and routine maintenance being carried out by a trained and certified service engineer working on behalf of a manufacturer. I too am a certified engineer and thoroughly enjoy getting to grips with a BA set. With the correct tools and a decent workplace, I find servicing a BA set quite a therapeutic exercise. Without the specialist tools, servicing is nigh impossible in some instances. Even replacing ‘O’ rings can be a headache, and getting companies to provide the tools needed can be like bashing your head against a brick wall. Some service items only need to be done once or twice in 12 years, but they still need to be done - so we need the gear to do the task. Admittedly, some items look as though they are made deliberately difficult to service so that we need to buy the specialist tools. I know this isn’t the case, and that parts are manufactured in a certain way to work, but sometimes I can’t help wondering. One thing that really frustrates me is the apathy surrounding the equipment. I hope that there are some, like myself, who look at BA as life-dependant equipment and as such, as PPE that should be treated with the utmost respect. Maintaining it to the highest possible standard is paramount, as someone’s life ultimately depends on it functioning 100 percent correctly, 100 percent of the time. It should be looked after, stored correctly and be kept ready for use. If it is faulty, remove it from circulation, obtain the parts and fix it, getting it back into circulation, ready to protect. Look out for and be sure to check BA that has been used and dropped where it was removed, usually out in the open with little or no protection from the elements, waiting to be collected. I’ve seen BA equipment that has been placed into vehicles and then other equipment stacked haphazardly on top of it, not only rendering it inaccessible, but causing damage to the equipment, making it unavailable for use in an emergency. Unfortunately, I find that for many people BA is just another tool and in some instances is treated with nothing but contempt. I have come across sets left out in the open, placed on the floor and with their masks that were laid face down in chemicals. The interior of the masks was as contaminated as the outside. This equipment had been used but had been made available for re-use, a policy which goes against all training guidelines. I would never expect anyone to use equipment thus contaminated, so why would anyone think it okay to do so? But, incredibly, what I’ve just described actually was the case. In addition, airline equipment has been found to have been used with oil sprayed onto the CEN connections to ‘lubricate them’, with the oil subsequently finding its way into the demand valve, hoses rewound back onto the drum, that were contaminated so badly with chemicals that they had to be destroyed. I could go on. No doubt you’ve seen such atrocities yourself. Surely BA is designed to give respiratory protection to the wearer? And yet it seems that in the majority of cases it is being used primarily as a ‘product protection device’, which ultimately means that the equipment is subjected to contamination by products that effectively render the equipment impractical for reuse. The bottom line is that BA is not designed to be used to stop paint, chemicals or products getting onto the wearer. It is designed to supply air to the wearer. Surely, then, the equipment needs protecting in these instances as well? I love training personnel in the testing, operation and use of breathing apparatus, and have now formed my own company, Bigfoot Training Limited. I still get asked if I can extend the training to every three years, and I still stick to my guns with annual refreshers. Hopefully, one day, health and safety managers will get the message. In the meantime I continue to offer my services up and down the country, and will continue to do so for some time to come. ? Mike Johnston owns and operates Bigfoot Training Limited. Mike is a former firefighter and fire officer, and a training officer within the chemical industry on Teesside. He subsequently worked for a national fire equipment supplier as a trainer for nine years, venturing out on his own in 2010. Bigfoot Training offers courses in Fire Awareness, Fire Extinguisher Operation, Fire Wardens, Standby Fire Duties (Fire watch), Standby Entry Duties and Radio Discipline. Mike is Scott accredited both as an engineer and trainer in their Contour, Centurion, Astral, ModulAir+2, Sprint and Flite equipment. email mike@bigfoottraining.co.uk or for more information log on to www.bigfoottraing.co.uk .